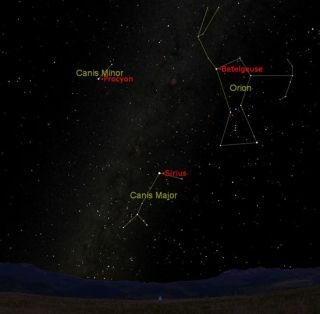 Procyon, Betelgeuse and Sirius form the Winter Triangle. More recently, the star has been under scrutiny to find any evidence of acoustic oscillations occurring within the star. In 2004, a team of astronomers was unable to find any evidence after a 32-day stretch of almost continuous observations, but follow-up observations with another telescope revealed there were oscillations. The phrase referred to the fact that Procyon (also called the Little Dog Star) comes into the sky shortly before Sirius (the Dog Star), which is the brightest star in the sky. Canis Minor and the constellation Canis Major (which Sirius anchors) are constellations that represent the hunting dogs of the hunter Orion, who also is immortalized in a constellation. Procyon is also one of the points, of the Winter Triangle asterism, along with Sirius and Betelgeuse. In Euphratean cultures, the star was associated with Kakkab Paldara, a phase meaning "the star of the crossing of the water dog." This was in reference to the nearby path of the Milky Way through the sky. The telescope also allowed astronomers to discover that Procyon is not alone in space; it has a small companion. Dubbed Procyon B, its influence on its much larger companion was noted in 1844 when astronomers saw wobbles in the motion of Procyon A.
Procyon B itself was viewed in 1896; astronomer Jim Kaler noted it is very hard to spot because the star is 15,000 times fainter than Procyon A, and is only five seconds of an arc from its larger companion from the vantage point of Earth's sky. The stars take just under 41 years to circle each other, and lie at an average distance of 15 Earth-sun distances or astronomical units, Kaler said. From looking at their orbits, astronomers determined that Procyon A has a mass of about 1.42 times that of the sun, while Procyon is 0.6 times as massive. "White dwarfs are the end products of moderate-mass stars," Kaler wrote. "Since higher mass stars die before those of lower mass, the star that created Procyon B must have had a mass a bit greater than Procyon A's, perhaps around 2.1 solar. During the giant stages that preceded the white dwarf, it lost roughly 3/4 of itself back into space through winds." A few years ago, there was some debate over whether Procyon A had oscillations on its surface. Canada's MOST telescope (for Microvariability and Oscillations of Stars) watched the star for an almost continuous 32-day stretch, but was unable to find any evidence. These oscillations, the authors wrote in their 2004 paper, are "resulting from sound waves travelling through the solar interior, [and] are a powerful probe of solar structure, just as seismology can reveal details about the interior of the Earth." A 2004 Nature paper in response to the finding, however, said that another team of astronomers had been able to find evidence of these oscillations. But they were faint. "We show here, using ground-based spectroscopy, that Procyon is oscillating, albeit with an amplitude that is only slightly greater than the noise level observed by [MOST]," the paper read. An X-ray corona was also discovered around Procyon in 1985. The corona is the gaseous area surrounding a star. In the case of the Earth's sun, the visual corona is most readily visible during a total solar eclipse, when the moon blocks the rest of the sun's light.